1 of 6 Heat oven to 375 degrees F. Coat 2 baking sheets with nonstick cooking spray. 2 of 6 In medium-size bowl, stir together flour, salt and baking soda. 3 of 6 In large bowl, beat butter, sugar until light and fluffy, 2 minutes. Beat in banana, ginger and vanilla. On low speed, slowly beat in flour mixture. 4 of 6 Drop mixture by rounded tablespoons onto prepared baking sheets, spacing the mounds about 2 inches apart. 5 of 6 Bake in 375 degrees F oven until lightly browned around edges and set, 8 to 10 minutes. Let stand on baking sheets 1 to 2 minutes. Transfer cookies to wire rack; let cool. 6 of 6 When completely cooled, frost and decorate with Lemon Glaze. 1 of 1 In medium-size bowl, whisk together confectioners sugar, milk, lemon rind, lemon juice and salt until good glazing consistency. Reserve 2 tablespoons. Frost tops of cookies with the remaining glaze, leaving the edges of the cookies unfrosted. Add food coloring to the reserved glaze. Stir in a few drops of milk for a good drizzling consistency. 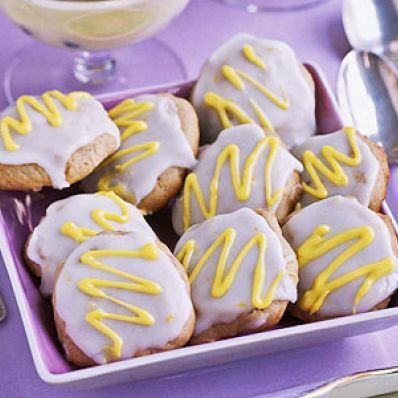 Dip a fork into thinned glaze and drizzle over the frosted cookies.